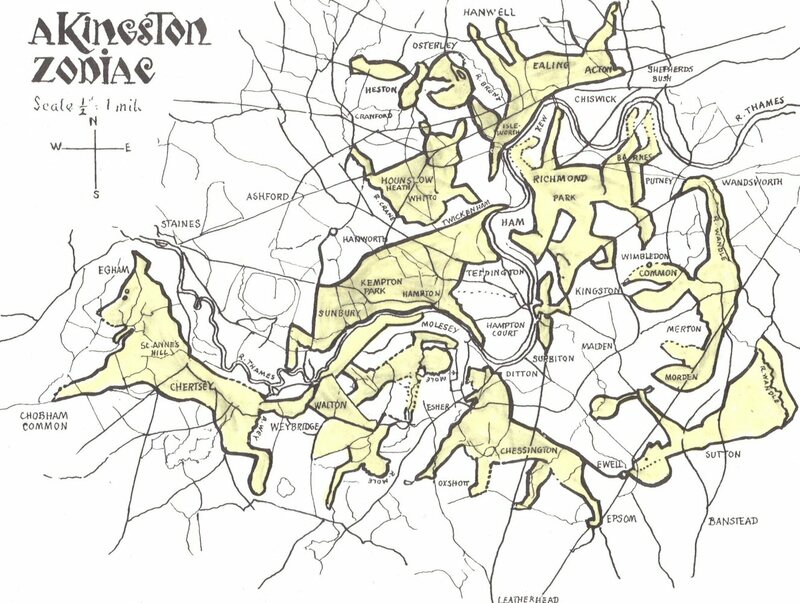 The Kingston Zodiac by Mary Caine reveals a landscape Zodiac around Kingston-upon-Thames in Surrey – outlined in the roads, paths and rivers surrounding that town. MaryCaine was spurred into study of Kingston’s surroundings by a friend’s comment that many of her local pubs had zodiacal names such as the Ram and the Bull. Drawing a circle around Kingston approximately 12 miles [19 kilometres] in diameter, she studied her maps and delved into legends, and images started to reveal themselves to her. First, she identified the lion, then the pair of twins and gradually the others followed. In all, she discovered 13 images – the 12 signs of the zodiac and the additional image of a huge hound whose purpose, she said, was to guard the circle. Enjoy. To those who can understand these drawings, they revealed the astrological influences that various places are under. I myself have not yet studied the Kingston Landscape Zodiac in great detail so I do not have too much to share about it right now. However, below are links to youtube videos in which Mary Caine herself walks you through each of the individual Zodiac effigies.